Hog Roast Donegal recently had a ball at teenager Nick’s football-themed birthday party, where we cooked a traditional centrepiece hog roast for 22 guests of family and friends. You may not know that we often cater smaller groups of people as well as huge crowds, and we can cater any number that you may have in mind. Regardless of formality or the type of venue, and whether you have a handful of guests or a thousand, we will do our utmost with regards providing delicious, homemade food made from local, fresh ingredients, and with service with a smile too. For Nick’s birthday celebration, Hog Roast Donegal was asked to make our famous pigs in buns from the hog, where we roast a locally-sourced pig from scratch at your venue, which produces tender, moist slices of pork and crispy, salty bits of crackling and we cram bits of both these into fresh bread rolls and then top with our own apple sauce and stuffing. They’re seriously tasty and our repeat customers are testament to this. On the morning of Nick’s 14th birthday, our chef and assistant headed to the park where the party was being held and we set our equipment up near to the football pitches. Once our gazebo and serving table was up, we prepared the meat by scoring it in diagonal shapes all over, then covered it in water to keep it moist throughout the cooking process, and also smothered it in plenty of salt, which gives us the crackling. 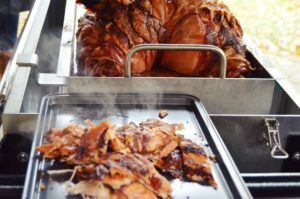 Once done, we set the temperature on the hog roast machine to low, turned it on and then the hog was sizzling away for the next few hours. We always keep a watchful eye on a hog roast, as we use gas-powered machines and an outdoor breeze could possibly blow the flame out, but we also need to ensure that the hog cooks thoroughly, all the way through, so that it’s ready for serving time. Serving time on this day was 1.30pm, and once Nick and his family and friends had a rest from the football, they queued up for a taste of heaven, Hog Roast Donegal style. Copyright © 2019 Spitting Pig Northern Ireland . All Rights Reserved.